Loughborough shutter experts, Just Shutters, bring you the quality service of a local company, with the assurances, cost savings and lifetime guarantee of the Just Shutters brand. Call us on 0115 838 2558 for more information about our beautiful range. 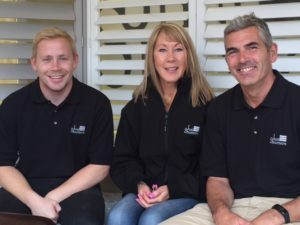 A local, family run business, Just Shutters Nottinghamshire offers the widest choice of shutter materials, styles and finishes in Loughborough; in fact the UK! We have many louvre size options and can even match colours for you to perfectly suit your room, so whatever your style, be it modern and elegant, traditional and timeless or vibrant and colourful, Just Shutters have the perfect product for you. Shutters are often purchased with the heart, people see their clean lines, their gently reflective sheen, their quality craftsmanship and fall in love with them. However, shutters provide much more to love than just their looks, shutters are a highly practical alternative to curtains and blinds. Shutters have often been viewed as a luxury product, this is mainly because of their high end good looks and being seen in interior design magazines and boutique hotels, and while they are a high quality craftsman made product, they provide better value than you may think, shutters retain their value by adding to the sale value of your home and provide excellent value year after year. In terms of window and door coverings, nothing stands the test of time like our shutters, no laundering or patch repairs, no moth or mildew damage, no warping or fading in the sun. Our lifetime guarantee allows you peace of mind, knowing year after year you can be confident in the quality of your shutters and their long term value. To know more about our beautiful range of bespoke interior shutters, to arrange a home design visit or ask us a question, please call us on 0115 838 2558. 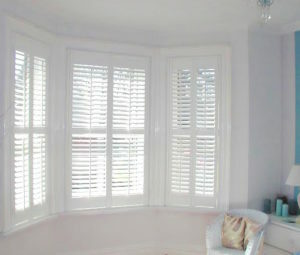 Plantation shutters fitted to dining room bay windows. Measuring making and fitting of window shutters. You may also like to see: Plantation Shutters Chesterfield, window shutters Nottingham, window shutters Derby & shutters Newark-on-Trent.